Martin P. Cooney Alderman of Chicago&apos;s 47th Ward? Yes!!! Dear Neighbors in the 47th Ward, Please take the time to watch the video of Martin P. Cooney. Martin and generations of his family have been an institution in Chicago. 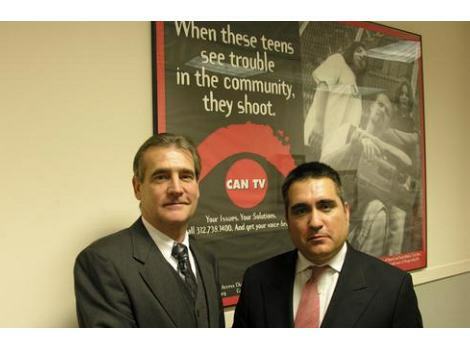 Martin was interviewed by Frank Avila, host of Election 2007. This video proves Martin is an asset to the 47th Ward and the City of Chicago. Martin and the entire Cooney Family, are a major blessing during difficult times. Please call Martin at 1-773-275-3515 or visit http://www.cooneyforalderman.com Please click here for video http://video.google.com/videoplay?docid=8999135471741808221 Photo by Patrick McDonough. Gene Schulter screwed over Ed Kelly. He is Judas traitor backstabber. My association with the 47th ward goes back to 1955. My association with the Cooney family, earlier. I often heard stories of the kindness of the Cooney’s to the Irish immigrants going tragic times during the depression years. My own parents being one of them. The previous posting is ever so true. I was a friend of Ed Kelly’s daughter in the 60’s. He made Schulter, and then…The 47th ward is ready for a change! Next PostNext Michael "Libby" Libert Alderman 42 Ward Chicago!! !